A few weeks ago I set out on a new series of articles through which I intend to scan the history of the church—from its earliest days all the way to the present time—to examine some of Christianity’s most notorious false teachers. Along the way we will visit such figures as Arius, Servetus, Fosdick, and even a few you might find on television today. We continue this morning with a false teacher who has at least 15 million followers in the world today, many of whom have undoubtedly knocked on your front door. His name is Joseph Smith. In 1820, in this time of confusion, Smith read James 1:5 which instructs those who lack wisdom to request it from God. He immediately withdrew to a wooded area near his home to pray for wisdom and it was at this point that he recalls having a vision of a pillar of light coming down from heaven and God the Father and Jesus his Son standing above him in the air. Smith asked them which of the denominations or sects were right and which he should join. He was told that all of the denominations were evil and corrupt. It was at the time of this experience that Smith became convinced he had been called as God’s prophet. On September 21, 1823, while praying in his room, he received an angelic visitation. This angel, named Moroni, told him that he had been chosen by God for a great work. He told Smith about a book written upon gold plates that had been buried alongside the Urim and the Thummin of the Old Testament. Smith immediately found this book, and, using the Urim and Thummin, translated it, and published it in 1830 as The Book of Mormon. This was the same year that he formally organized the Church of Jesus Christ of Latter-day Saints. A commanding and gregarious figure, Smith began to amass followers. As the movement grew, it migrated west, in large part because their teaching was not welcome in most places and was often opposed with threats of violence. Smith moved first to Ohio, then to Missouri, then to Illinois. As the movement grew, it required more and more revelations, and Smith received them as need arose. These revelations continued until his death and were compiled into a book referred to as the Doctrine and Covenants. There was strife within the Mormon church, and in the spring of 1844 it led to threats of violence between Smith and others in the town of Nauvoo, Illinois. The governor intervened and imprisoned Smith until he could stand trial. Before this could happen, though, an armed mob stormed the jailhouse where he was being kept, and Smith was shot and killed while trying to escape through a window. 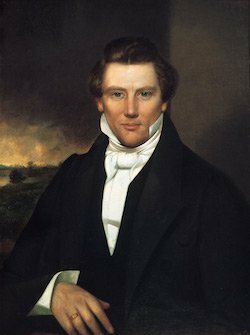 The heart of Joseph Smith’s false teaching was that he put his own authority over the authority of Scripture. He added his own revelation to the Bible’s revelation and took it upon himself to identify and correct what he claimed were errors in Scripture. Smith believed that the Bible was corrupt and insufficient and for that reason both took away from, and added to, God’s written revelation. Regarding the Bible’s corruption he said, “I believe the Bible as it read when it came from the pen of the original writers. Ignorant translators, careless transcribers, or designing and corrupt priests have committed many errors.” These errors were both typographical and doctrinal. To address the Bible’s shortcomings, Smith produced his own translation of the Bible, making many corrections and additions to a variety of Old Testament and New Testament books. He also claimed that his own revelations from God were the only access point to the true gospel that had apparently been lost. Mormon historian Richard Bushman says the “signal feature” of Smith’s life was “his sense of being guided by revelation.” He placed himself above all previous revelations and interpretations of the Bible—even those of Christ himself. Joseph Smith gained many devoted followers during his lifetime. Immediately after his death, his followers split into two main groups: those who followed Brigham Young to Utah to become the modern “Church of Jesus Christ of Latter-day Saints,” and those who coalesced under Smith’s eldest son, Joseph Smith III to become the modern “Community of Christ” (formerly known as the “Reorganized Church of Jesus Christ of Latter-day Saints”). These are the two main groups who follow Joseph Smith today. They continue to adhere to his false teachings about the Bible and countless doctrines contained within it. They continue to deny the inerrancy and sufficiency of Scripture while elevating personal experience above the authority of the Bible. In total they number approximately 15 million and their ranks continue to grow through constant and systematic proselytization. The Bible claims that it is the authoritative, infallible, inerrant, sufficient revelation of God. “Every word of God proves true; he is a shield to those who take refuge in him. Do not add to his words, lest he rebuke you and you be found a liar” (Proverbs 30:5-6). It offers this dire warning: “I warn everyone who hears the words of the prophecy of this book: if anyone adds to them, God will add to him the plagues described in this book, and if anyone takes away from the words of the book of this prophecy, God will take away his share in the tree of life and in the holy city, which are described in this book” (Revelation 22:18-19). There is no historical evidence that the Bible was missing information or that it had been corrupted before it was compiled into the Old and New Testaments. The fact that Jesus quotes the Old Testament with such confidence and without any hint that it is lacking or misrepresentative is reason enough to accept it as the pure and true word of God (John 17:17). The New Testament has also been repeatedly proven as unchanged and undefiled since it was first given by God. The diversity of interpretations and sects among those who claim to follow the Bible, the very context which so confused Smith and led him to create an entirely new religion, does not provide warrant to say that the Bible itself is ambiguous or lacking in any way. We are told to expect divisions and factions among the body, “in order that those who are genuine … may be recognized” (1 Corinthians 11:18-19). Mormonism itself has been cut by endless in-fights and divisions, showing that the problem when the fractured church is not corrupted Scriptures but corrupted hearts.